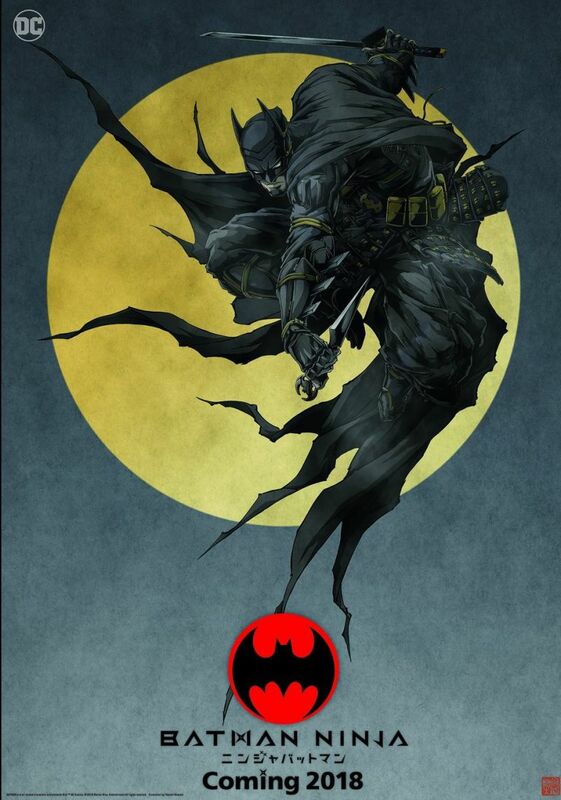 Last week we learned an anime take on Batman would be joining the lineup at New York Comic Con, with Afro Samurai creator Takashi Okazaki taking part in a panel for Warner Bros.' newest direct-to-video feature length animated movie that reimagines the Dark Knight as a ninja. Character designer Okazaki was joined by director Jumpei Mizusaki, screenwriter Kazuki Nakashima and English-language screenwriters Leo Chu & Eric Garcia for the anime's New York Comic Con panel, with the panelists detailing the "colorful" and "imaginative" take on Batman and many of his iconic connected characters ahead of the anime's 2018 release. Warner Bros. Home Entertainment head of publicity Gary Miereanu introduced Nakashima, Okazaki and Mizusaki, who revealed they were approached by Warner Bros. for the inventive project, which will see Batman and his allies - and villains - time-traveling back centuries to medieval Japan. No voice actors from the Japanese or English cast were revealed, but Miereanu promised the cast will be "voices you'll recognize." In the premiere teaser trailer, Batman - in bulky Samurai-inspired armor - confronts the Joker. "A hero can do everything but kill," the villain says. The criminal clown has a spectral feel to him, looking as insane and as scary as ever - like Ryuk's demented cousin. Then, quick glances of Batman's friends and foes: Nightwing leaps into action, striking a blow against the Penguin. Robin brandishes a sword. Poison Ivy whips out her own. Catwoman takes on Harley Quinn. A men-yoroi - a facial armor - is removed, revealing the scarred visage of Two-Face. A last surprise: Gorilla Grodd, seemingly a feudal lord, reigns supreme. End. The animation is rich, fluid and colorful. Despite the Japanese twist, your favorite characters are easily recognizable. It's a brazen new take on the Dark Knight that - going from the tease - just might offer some of the best fight scenes in the caped crusader's storied history. The crew assembled on stage were sure to keep details close to the chest, but it was apparent by all this was a project to be excited about. Okazaki and Mizusaki, who revealed they were approached by Warner Bros. with the idea, said they're lifelong Batman fans who were excited to present the caped crusader in a way he's never been seen before - complete with action sequences they hope will excite fans. “There’s a fight scene in this that might be the best fight scene I’ve seen in animation anywhere,” Miereanu said. “When we want to make it look real, we actually do it in real life,” Mizusaki said, adding that performers acted out the fight in live-action, with the recorded choreography used by the animators as a reference point. “We want it to be true to life,” he said. Everything - from the way blades are gripped to the swift and brutal blows - had a real life counterpart. “We’re not seeing Japan through the eyes of Batman,” Garcia added. “We’re seeing Batman through the eyes of the Japanese.” Garcia said the movie is a love letter to the Batman mythos, with a cache of easter eggs and surprises in store for fans. The floor was turned to the audience for a Q&A, and fans were quick to inquire about just how much of the DC Universe is reimagined in Batman Ninja. “The characters are reinterpreted in a way that they seem fresh and new,” Cho added, with Okazaki and Mizusaki agreeing it was pivotal for the creative team to remain true to the characters' core appearances and personalities despite their Japanese makeovers. When asked if the violent-looking Batman Ninja would feature the bloody loss of limbs, Chu answered the film will be rated PG-13 for "intense action." Asked if the creative team would like to reimagine other superheroes into anime productions, Okazaki, Nakashami and Mizusaki didn't point to any one in particular, but agreed future productions would depend on how well Batman Ninja performs. “I put 200% of my energy into designing Batman Ninja, and I would be more than thrilled if all of you enjoy it,” Okazaki said. An encore of the Batman Ninja trailer received uproarious applause, ending the panel. Warner Bros. will release Batman Ninja sometime in 2018.